Hey guys and girls. New layout as you can see. Hope you like it! Let me know your thoughts on it! Here are my 3 picks for this week. Oh how I wish I hadn’t spent all my money! 3. This gorgeous Tote bag from Urban Outfitters. I love the floral print and it’s the perfect size. 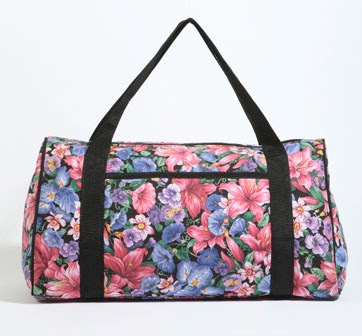 It’s designed to be a gym bag, but its way too pretty to use for sweaty clothes! I’d use it to carry all my uni stuff in. I want it so bad! It costs £24.00 which isn’t too bad at all. Somebody buy it me? Find it HERE. 2. I’ve wanted this coat since the moment I saw it on the Next adverts. I think this one can go on my list to Santa as I have been a very good girl and I really need a new coat! I love the colour! It’s £45.00, so not too badly priced for a winter coat. It probably won’t look as nice on me as it does on the model though! Find it HERE. 1. As you have probably heard, Jimmy Choo is launching a range for H&M next month. It got me all excited! The collection is made up of shoes and bags, and I love it! I really like the ones on the far right of the picture. There are also some ankle boots with stud detail in the range that I’ve got my beady eyes on. The shoes start from £69.99, I know, steep, but it IS Jimmy Choo after all. Find them HERE! So that’s that! Not really much else to share today. I’ll let you all know about the new brief we have at uni at some point tomorrow. It’s really good!